Setting & time: Florence, Italy, contemporary. Harvard Professor Homer Kelly is invited to teach for one school year at a new school for American students in Florence, Italy. One of the teachers has been in prison in the USA for murder, another one is a boring creep, the students are the usual mixed bunch, including one socially-inept stalker type and a ravishingly beautiful female student with issues, and the school secretary really works for the city’s top drug baron, who is planning to use a religious fanatic to assassinate the pope, whose anti-drug campaign is affecting business. I picked up this book mostly because of the title. I haven’t read The Divine Comedy, mostly because I couldn’t decide which of the many English translations to choose, but I did wish I had the one quoted in the book on hand – I believe it was the Sayers translation. However, it didn’t really matter that I didn’t have it, since it isn’t that important an element in the book. 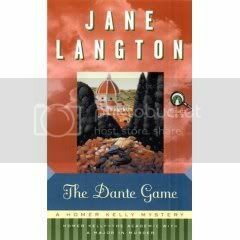 The titular Dante game is a game devised by the man who teaches the Dante course in the book, where he gives the students a list of clues and they have to recognise which passage from the book it refers to and find an object connected with it. This game is utilised as a diversionary tactic by the story’s criminals to cast suspicion on the students and staff of the school by stealing some of the objects the students were meant to find. The main plot concerns a drug baron’s plans to use a man who is a fanatic for religious reform to assassinate the pope, because he has declared a holy year against drugs, which has seriously eroded the business for the drug lord. The characters are mostly well-developed but none are sympathetic, not even the beautiful young woman who is one of the central characters or the teacher who is half-paralysed with love for her, and there is no mystery because the author lays all the cards on the table for the reader. The only bit of detection anyone does in the book is one teacher’s desperate search for a missing student he has fallen in love with, and the series detective is reluctantly drawn into that search. The pace is slow and steady until the last 50 pages or so, when it starts rolling and picks up the pace. The thriller plot is pretty good, but somehow things don’t quite come together. It may have been the pacing, or possibly the characters, and definitely the lack of detecting had something to do with it. What really makes this story an interesting read is the combination of Dante, Florence and the author’s drawings of the city. The author expresses her love for Florence very clearly in the background narrative and makes it come deliciously alive for the reader, which is why I am giving it 3 stars and keeping it – but on the travel books shelf and not with the crime books.